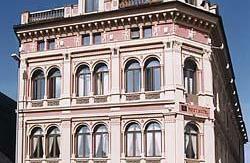 Drammen Hostel has a bit of luxury since it share some facilities with a 4 star hotel. Bed linen, towel and a 4 star breakfast is always included. You check in at First Hotel Ambassadeur. The building is from 1877, and the rooms were originally suites in a 4 star hotel. Now these rooms have 6-12 bunk beds, and is used for backpackers, school classes, sport teams, families etc. If you are a group of 4 people or more, please ask the hostel whether they can reserve the whole room for you. As a guest at Drammen Hostel, you are welcome to use the Bar and Restaurant at the 4 star hotel next door. Bed linen, one towel, and a 4 star hotel breakfast is included in the rate. Wireless Internet is also included, both in rooms and common areas. From the central train station: when you go out of the station, you will come to Stromso Torg, a large square renovated in 2012. On the other side of this square, you will find the First Hotel Ambassadeur, where you check in.